Frankie has had a hard life, though she is better off than many of her kind. Frankie is a Siamese-mix girl who is fortunate to have a home, but because of tension between her and her sibling, Frankie was forced to live in the shed and outdoors while her sibling lived inside the house. Her family had gone out of town for several days, but Monica, a very nice neighbor, took care of her while they were away. When Frankie failed to appear for her evening meal, Monica was a bit worried. It was not until the next day that Monica found Frankie across the street in a neighbor's tree. I arrived to find Frankie resting on a branch less than 20 feet high. At first I assumed the tree was a live oak because of its spreading shape and the fact that there are several live oaks that grace the front yards of many homes in this area. It took me a while to notice that this was a very old tallow tree instead. I have never seen a tallow tree look anything like a live oak before, so perhaps I am misidentifying it. 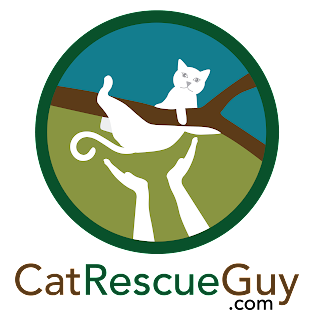 Regardless, it had the same structure and shape of a live oak, and where cat rescues are concerned, that is not a good thing. Frankie seemed unconcerned about me, so I was beginning to think she would be a friendly and cooperative cat. That is just what I want in a tree like this, because I often find it very difficult to reach many of the areas of the tree due to the lack of suitable places to tie a rope above the target area. Fortunately, however, I spotted a suitable tie-in place directly above where Frankie was resting. If she was cooperative, this would be an easy rescue. 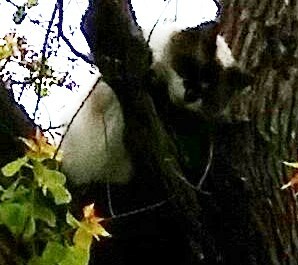 Shooting my throw-line in the tree with my large sling-shot often scares some cats, and indeed, Frankie was suddenly energized and distressed by that activity. Unfortunately, I found the tree was snagging my line to an exceptional extent, and I found it necessary to pull on it very hard to pull the line free. This caused some small limbs to break and fall, and each time this happened, Frankie became even more distressed. Frankie ran higher up her branch, and now my selected tie-in point was useless for reaching her in her new position. I selected a new tie-in point, and again the tree snagged my line, and again Frankie became more frightened. This time she ran back down the branch to her original position and tried hard to descend even farther. The branch was too steep for her at that point, so she pulled back and stayed there. I have seen frightened and panicked cats run down steep sections of a tree in a barely-controlled way holding on as best they can, and I was expecting Frankie to do the same now. Honestly, I was hoping that she would, because I could see that this was not going to be an easy rescue. Instead, she stayed put and settled down. Since it was now clear that Frankie was not going to allow me to get close to her, I knew I had better set my ropes in a way that would allow me to roam the full range of the branch so that I could follow her wherever she went. I proceeded to set tie-in points for two ropes in two locations for that purpose, so again I had to shoot my throw-line into the tree at least two more times. Predictably, Frankie became frightened, and, again, I could see that she was thinking about running down the tree. Then Frankie surprised me. Instead of running down the tree, she boldly leaped far out and away from her branch, spread her legs out, and jumped to the ground in perfect form. She ran off behind the house as quickly as she could. I was glad she was down and did it that way to save us both the stress and trouble of a chasing rescue in the tree. She wasn't very high, and she landed perfectly, so she would be fine. All in all, I was satisfied and happy. I called Monica the next day to see how Frankie was doing, and I am happy to report that Frankie is doing just fine. She has been getting some extra attention and loving from Monica and is sure to get more of the same from her family when they return. Since I never even began to climb the tree, I never got any video. The only still picture I took is shown above, and that is the only record I have of Frankie. I wish I had video of her daring leap to the ground, because that was a sight worth seeing. From my vantage point below her, with her whitish belly and fully extended legs, she looked like a graceful, yet athletic, hairy parachute plummeting too fast toward the ground. It was a memorable image.